One day, Moses was tending the flock, and he came to Horeb, the mountain of God. Suddenly, Moses saw a bush that is on fire but not burned. 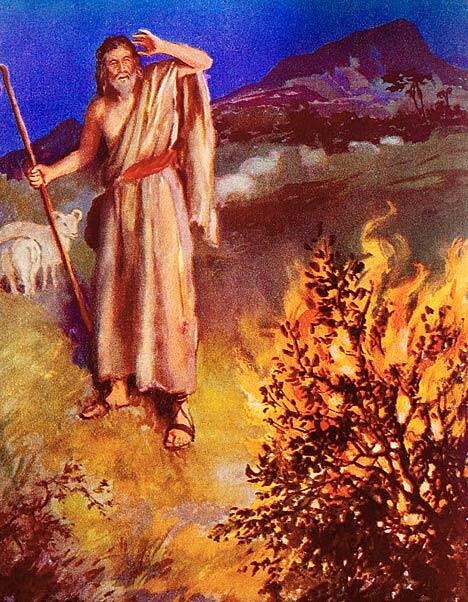 Moses was very curious so he went nearer the bush to see what is so special about the burning bush. Moses threw the staff on the ground and it became a serpent. Moses ran away from the serpent. God said, “Pick the serpent up by the tail that they may know that I am the God of Abraham, Isaac and Jacob.” And the serpent became Moses’ staff. Then God said, “Put your hand in your bosom.” Moses placed his hand in his bosom and drew it out and it became all white and leprous. God said, “Put your hand in your bosom again.” Moses did and it was restored back to normal. So Moses went back home and tell Jethro, his father in law that he want to return to Egypt to see his brethren. Moses mounted his wife and two children on the donkey and set out for Egypt. Moses took the staff along with him. While Moses was on his way to Egypt, he met his brother, Aaron. Aaron was very happy to see Moses and they hug each other. Moses told Aaron what God had spoken to him and committed him to do. After that, Aaron follows Moses to Egypt. When they arrive at Egypt, Moses told the people of Israel that God had sent him to deliver them out of Egypt to the Promised Land which will be overflowing with milk and honey. Then Moses performed the miracle signs in front of them. The people believed Moses. When they heard that God had heard their prayers and will bring them out from the hardship Pharaoh had afflicted them, they bow down and worship God.